Many things are recorded in Matthew 14 that overshadows this little incident. First, John the Baptist, cousin of Christ was killed by Herod. This marked a very significant point in the ministry of Jesus, for it could be said that John was perhaps Jesus‘ biggest supporter, a coworker for God‘s Kingdom at a time where most followers were still merely blindly following Christ without really knowing what they’re going into. And then, there was the miracle of the loaves, perhaps the most well known miracle today. Most people do not know that it happened twice, but that’s a discussion for another day. As amazing as it was for man to walk on water, Jesus was a man who had calmed the storms and had made food from nothing. Perhaps Jesus walking on water is no big deal, but I’d like to focus more on the fact that Peter walked on water – yeah, just for a moment, but that moment would prove a lot to us. I really like Peter. Sure, he had a lot of faults. Even later on during his apostleship he was scolded by Paul (Galatians 2:11-21) for being a hypocrite. But I really like the man and his deeds. They teach a lot. And Peter‘s so human that it’s easier to relate to him than to the likes of Paul. I think Jesus was being very harsh here. I personally feel that Peter was a man of immense faith, a man of pure faith, a man of blind faith. There were no complexities in his faith – see Jesus walking on water? Surely he can make me do that too! Get questioned on my love of God? Answer I love God with gutso! Random people trying to seize Jesus? Defend him – whack the sword around and hack someone’s ear off! See Jesus being captured? Follow him even to the depths of the enemy’s lair! Peter was backed up in his faith by a very courageous heart, a heart that no one else in his time possessed. Sometimes I wonder, if I were to be one of the other 11 disciples, how would I feel when I saw Peter standing on water? I suppose I would have been rather mind-blown. No wonder the disciples were all able to be great apostles later on. How could you not have faith, when you witness things like that? Jesus liked to reprimand people, “you of little faith!” [Matthew 16:8; Matthew 8:26; Mark 4:40; Matthew 6:30; Luke 12:28]. Let’s talk a bit about relativity. Christ knew the potential of faith we can have. So when Peter‘s faith was enough for him to attempt the impossible, but not enough to sustain him for more than a moment, Jesus scolded him for his insufficient faith. To us, and perhaps to the other eleven, the fact that Peter asked to do that was an act of immense faith, because we do not know the upper end of our faith meter – but we do know the lower end of it. Some may say Peter was foolish, but I beg to differ. True faith is never foolish, though we’ve been told that wisdom in God’s eyes is often scoffed as folly by the world [1 Cor 1:18]. Peter didn’t ask to do it because he didn’t think and was stupid. He did it because he believed that it was possible. Granted, to a lot of people it must have seemed foolish. If you put me in that situation, even if I believed that it was possible, I wouldn’t have asked to do it, thoughI would be more than happy to see somebody else doing it. Surely my faith will benefit from watching; but I wouldn’t do it. Why? Why did you doubt? Asked Jesus. What is doubt? A dictionary definition would be the uncertainty about the factuality or the existence or the truth of something. We often forget that doubt and trust are not mutually exclusive. As much as you believe, there’s always still space for doubts. Couple of years ago I caught the film Doubt, and let me quote you Father Flynn’s sermon from the movie. I wanna tell you a story. A cargo ship sank one night. It caught fire and went down,and only this one sailor survived. He found a lifeboat, rigged a sail, and being of a nautical discipline turned his eyes to the heavens and read the stars. He set a course for his home, and, exhausted, fell asleep. Clouds rolled in, and for the next 20 nights, he could no longer see the stars. He thought he was on course, but there was no way to be certain. And as the days rolled on, and the sailor wasted away, he began to have doubts. Had he set his course right? Was he still going on towards his home? Or was he horribly lost and doomed to a terrible death? The message of the constellations, had he imagined it because of his desperate circumstance? Or had he seen truth once and now had to hold on to it without further reassurance? There are those of you in church today who know exactly the crisis of faith I describe, and I wanna say to you, doubt can be a bond as powerful and sustaining as certainty. When you are lost, you are not alone. the Son and the Holy Ghost. Amen. –excerpt from Father Flynn’s sermon from John Patrick Shanley’s movie, Doubt, 2008. Doubt can be used in the right way to build our faith. What do you do, when you have doubts? You question, you ask, you seek answers. While there are some things that are beyond the understanding of Man, and there are some questions that do not have answers, generally, doubt can motivate us to pursue greater understanding. I’m not sure if that’s what Father Flynn meant, but I agree with that statement. When you doubt, and when you’re lost, you are not alone. I suspect the best way to battle doubts is to immerse yourself more into God’s words. These doubts will always serve as cracks of entry for the devil, so we need to be wary, but in dispelling out doubts we need a better understanding of the Word, which will in turn bring us more faith. Doubts that were once dispelled can arise again one day. Doubts always enter our head, because the devil never stops his accusations – for the accuser of our brothers, who accuses them before our God day and night [Revelation 12:10]. Jesus asked Peter, why did you doubt – but he already provided the answer. Peter doubted because he didn’t have enough faith. I mentioned that I feel Peter already possessed immense faith to step out of the boat. But the faith required to perform a humanly impossible act was beyond what Peter had known. The insufficient faith allowed room for doubts to sprout out in this massive action. Jesus asked, why did you doubt, but it was rhetorical. His point was, you shouldn’t have doubted; you needn’t have doubted. I am here. You are safe. If a person is going to fall, most people will only notice it when they’re already on the ground. What more when Peter was standing on water – to be able to react in time and catch Peter without him disappearing beneath the waves – it was very likely that Jesus knew what was going to happen – he could feel Peter‘s wavering faith, he could anticipate his fall, he could thus react and catch him in time when Peter cried for help. According to the Bible the waves were strong because the wind was against the boat at that point [Matthew 14:24]. The wind only died down after Jesus and Peter climbed into the boat [Matthew 14:32]. 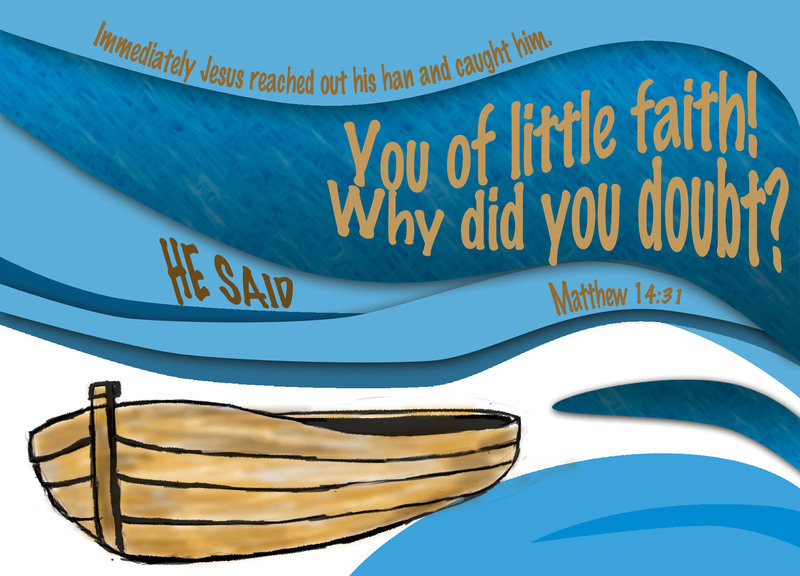 Peter‘s faith took a dive when he stepped out of the boat and saw the wind. From these verses we know that the waves were strong, and the sea condition at that point was poor. It’s not like how we often picture this scene – Jesus treading peacefully through still water and Peter tripping through the calm sea. I mentioned this to bring out how amazing it is that Jesus could grab Peter‘s hands, but somehow I leaned towards defending Peter a little – it must have been really scary at that point! Despite scolding Peter you of little faith, Jesus still saved him. He could have let Peter go under the water and struggle a little before saving him, but he didn’t. Before he fell under the water, Jesus reached out his hand and caught Peter. What was the situation like? It wasn’t on still ground, it was on rocky waves – I find it hard to imagine that Jesus, by stretching out a hand, could grab Peter and support his weight. It’s more likely that by catching Peter, Peter was steadied by Christ, and could stand on the water. Pure speculation on my part, of course. Very interesting to picture, though. Later on, Jesus promised, but I have prayed for you, Simon, that your faith may not fail. And when you have turned back, strengthen your brothers [Luke 22:32]. Our faith may at times waver, but He will never cause us to lose our faith. We will always be able to turn back to him, even if our faith wavered, even if we doubt, even if we fell; and when we do turn back into his hands, we will be able to, in turn, strengthen our brothers. What was Peter‘s faith when he stepped out of the boat on the word, ‘come‘? It was the faith that he could walk, as did Jesus, on water. It was the faith that even if he tripped, Jesus would save him when he cried, ‘Lord, save me!‘ And what was Peter‘s doubt? The wind prompted that thought of doubt. Doubts and fears and worries – they are good friends and go hand in hand. They are not mutually exclusive with faith – faith and doubt can coexist. But faith and doubt are enemies. They will always be competing against each other for more presence in your mind. Let us, who are of little faith, use our doubts as a motivation for pursuing greater understanding, and in doing so, increase our faith. Whenever you doubt, remember – why did you doubt? Thank you for sharing. That was really powerful. I completely agree with you that doubt is okay. We can’t grow stronger in our faith unless we are asking questions and seeking out answers. wow, nice work. I was smiling and about-to-laugh with “Jesus liked to reprimand people, “you of little faith!” – just like me. God bless.